Sometimes parents have to make hard decisions. Do you let your child go to school in the entirely outlandish outfit... that they dressed themselves in for the first time. When is old enough to let your child go on their first overnight to a friend's house by themselves. When is it time to let go of a favorite shirt or toy. There are many systems that people advocate for the toy situation. Put them in a box out of sight, if they don't ask for it, it can go. What about when the toy is a beloved item, but it's at the point of getting dangerous, because it's worn out or broken? or it leaves a mess everywhere it goes? 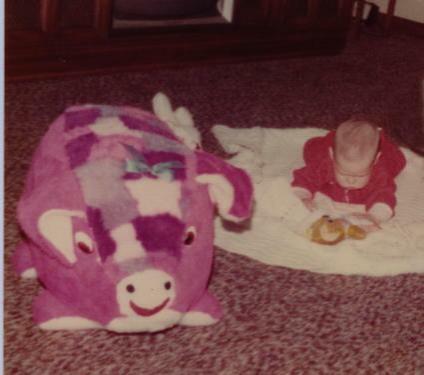 As a child, I had a beloved purple patchwork pig. I LOVED that pig. I don't remember too many of my toys from early childhood unless I still have them or a picture to jog my memory. But I have always remembered the pig. One day I came home to find my beloved Piggie gone. At some point she had gotten a hole and started leaking the sawdust that was used as filling for her. I would always climb on Piggie and bounce on her so I can only imagine the sawdust that was getting everywhere. My mother felt it was time for Piggie to go, along with a few other toys. I don't recall if I noticed anything else missing, but I do know that I shed mighty rivers of tears over the departure of my dear beloved Piggie. Until yesterday I didn't know there were any pictures of my beloved Piggie, then my mother sent me a little surprise via email. She's been scanning in and transferring many old photos and she happened across my first encounter with Piggie, when she was all new and for the part so was I. Too cute and special that you have a picture to remember him by. Mine was a pink snake. i had a similar green squirrel/cat type beloved stuffed animal. beauty is in the eye of the beholder. tis true. Very nice. Mine was a huge blue bear who used to sit in a small green chair in my room.